Parliamentary commission is studying the issue of the jury trial. 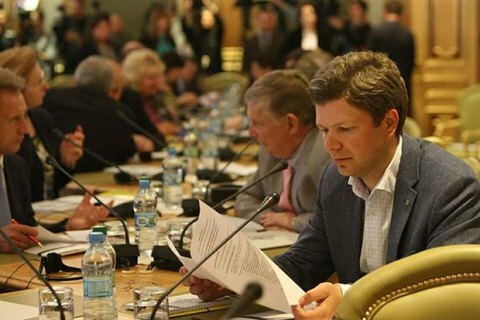 The draft law on judicial system and status of judges, currently drafted by the parliamentary working group on justice within of the Constitutional Commission will lay down the framework for a quality judicial reform in Ukraine, MP Leonid Yemets (People's Front) told reporters on 20 May. The deputy head of the committee on legal policy and justice says the bill provides for several novels: a three-tier court system, through re-evaluation of judges, and that the Supreme Court will become the ultimate judicial authority. "This means that the Supreme Court will interpret the judicial practice in such a way that it will be binding on the lower courts [...] Now, a decision that the Supreme Court issues will be final and binding," said the lawmaker. "Secondly, all highest specialized courts and administrative courts will be abolished. We will have common courts, appellate, and the Supreme Court." The third feature of the judicial reform should be a sweeping re-evaluation of judges, which implies a new quality of courts. "This means checking into the whole lifecycle [of a judge]: where he has received his salary, where did his money to buy a car come from, how it corresponds with his income, and is this person good enough to be a judge," Yemets said. Yemets stressed that the re-certification procedures must be transparent. "Everyone should be able to watch the interview with the judge online, to hear his answers. This will add credibility to the court as such, this corresponds to the will of the people, and we shall finally see a fair and just trial," said Yemets. The representative of the People's Front also said that the working group is seriously considering implementing jury trial.